Whether you’re brand new to the sport, or you’ve been riding dirt bikes for years – safety is always of paramount importance. Sometimes, the simplest mistakes can result in crippling injuries that could otherwise be easily avoided. If you’re new to dirt motorcycling, it’s important to become educated on safety around bikes (and tracks) before attempting to ride through unfamiliar terrain, on unfamiliar vehicles. So, let’s explore some safety tips that’ll be sure to save some pain, as well as provide an added measure of safety. 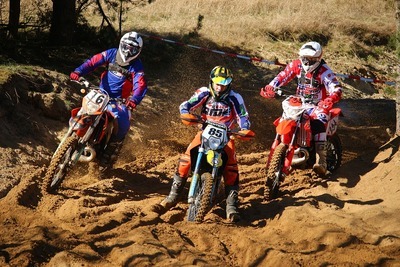 A helmet is absolutely critical to motocross riding. As this piece protects your head, be sure to check that it is a quality helmet. Ensure that it fits your head properly, and that you wear it every time you ride. Never attempt to ride your bike without a helmet. Goggles are imperative for eye protection, as well as for keeping dirt, grit and dust from your eyes. It’s incredibly important that your vision be unobscured when riding. Again, ensure that the goggles you choose are durable, and well made. Neck braces add a tremendous amount of protection against serious and debilitating neck injuries, and are utterly essential to any motocross rider. This is a piece of protective armour that should never be forgotten. A chest protector is highly recommended to keep the upper torso covered. This piece will help keep the inner organs or other body parts from direct impact damage, providing an added layer of padding between you and the road. Knee braces are incredibly important to any frequent rider, as knees can be subject to immense abuse during a rough fall. Gloves are also a staple to protect both hands and wrists not only from falls, but also from debris. Boots shouldn't ever be left off the list of essentials, as they offer protection for your lower leg, ankle, and foot, another set of body parts that can be seriously injured during a bad fall or crash. As a dirt bike rider, you should always aim to ride with company. It’s also imperative to remember to dress for the crash, and not the ride. Practice is important. You shouldn't try to replicate the impressive jumps often seen on YouTube. Work up to them, try simple manoeuvres first, do not attempt to ride ahead of yourself. Search for a nearby motocross track, and put your new bike and gear to work there before attempting to go off-road. If you do go off-road, pay attention to signs, stay on frequently used trails to avoid holes, rocky paths, or fencing. Finally, have fun. Enjoy your new gear, and your bike. 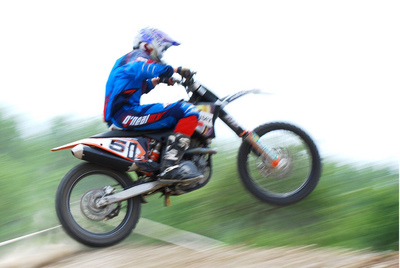 Motocross riding is about having fun!